PivotViewer is the latest tool to come out of the Microsoft Live Labs Pivot project. Pivot is based on collections, which are sets of data where each item has an associated image. A pivot item has attributes, similar to properties, called facets; and facets have facet categories. Facet categories are used to filter and sort the data. More complex Pivot data sets have several linked collections, or dynamic collections which are generated at runtime as a query result. This is necessary if the size of the data set is very large or even unbounded. You could create a web search, for example, that returned a pivot collection. 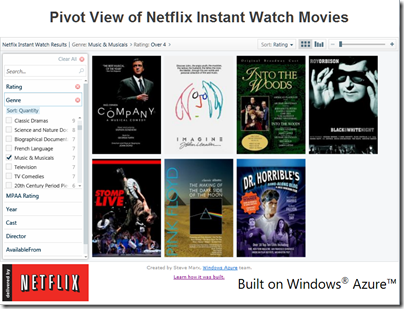 Once you have created and hosted your Pivot collections, most of the work of displaying them is done by the Pivot client. 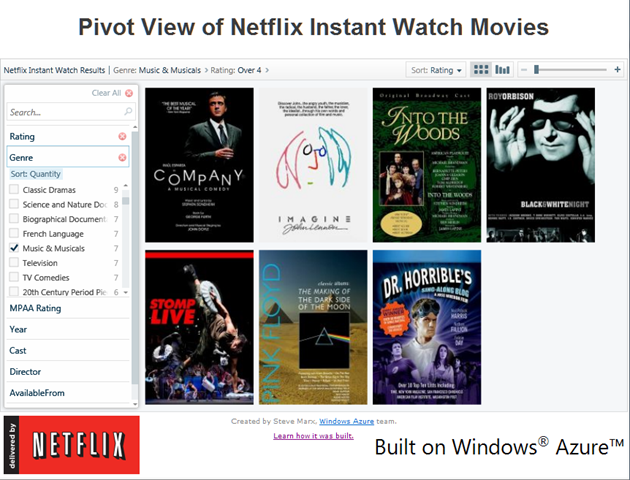 There is a desktop Pivot client, which is Windows-only; but the Silverlight PivotViewer is more useful since it allows a Pivot collection to be viewed in a web page. The client (or control) does most of the work of displaying, filtering and sorting your data, including a user-friendly filter panel. PivotViewer also makes use of Deep Zoom, also known as Seadragon, which lets you view vast images over the internet while downloading only what is needed for the small section or thumbnail preview you are viewing. 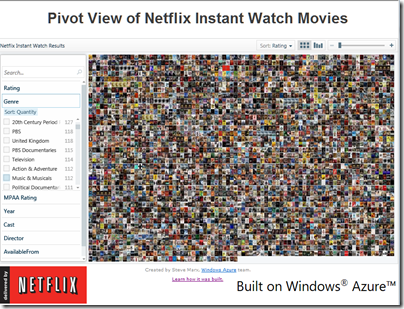 The result is that a developer like Azure Technical Strategist Steve Marx was able to create a PivotViewer for Netflix with only about around 500 lines of code. This kind of product selection is a natural fit for Pivot. I was quickly able to find the highest-rated music movies in the Netflix Instant Watch collection. Starting with the full set, I checked Music and Musicals and then set Rating to 4 or over. It seems to me that the strength of Pivot is not so much that it offers previously unavailable ways to visualise data, but more that it transforms a complex programming task into something that any developer can accomplish. Microsoft at its best; though of course it will only work on platforms where Silverlight runs. Still, it looks plausible. So what’s new? 1. Elevation of the Slate as a key form factor. The slides refer to three basic form factors: Slate for web and media consumption, laptop for productivity and all-in-one touch control desktop for both. 2. 3D content display along with “HTML 5 video” and DRM, focus on DLNA. 3. Instant On, always connected. Hang on, wasn’t this promised for 7? And Vista? The docs do refer to a “New Off state” called Logoff + Hibernate, with optimised hibernate plus a “Boot/Shutdown look and feel”. The idea is that this becomes the norm for a switch off. 4. Log on with face recognition. One of the few pieces of real innovation on offer here. 5. Proximity based sleep and wake. 6. Another go at the Windows App Store. This time Microsoft is serious. Approval process. Dashboard for developers with telemetry. Auto update. 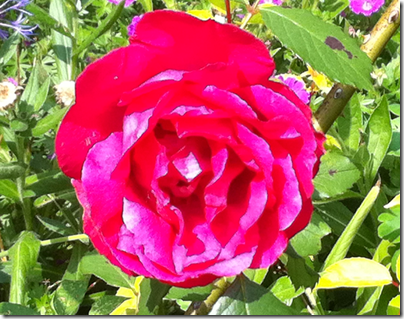 Software license roams with the user, as do settings – a great idea. Partner co-branding, ho hum. 7. Reinstall or “reset” Windows while keeping apps, docs and settings. A bit like the old repair install, though the difference here seems to be that this is a genuine wipe and reinstall, with apps reinstalled from the App Store. 8. Windows accounts “could be connected to the cloud”. I would think they must be, if the app store stuff with roaming software licenses is to work. Hooking your Windows login to a Passport ID is not new though; I’m guessing it will just be more prominent and important. Needless to say, this is not the whole Windows 8 story, even if genuine. What do we learn though? Mainly that Microsoft is taking its lead from Apple and accepts that the App Store concept is central to our future computing experience; the Slate also seems influenced by iPad. We are also seeing the return of Passport. 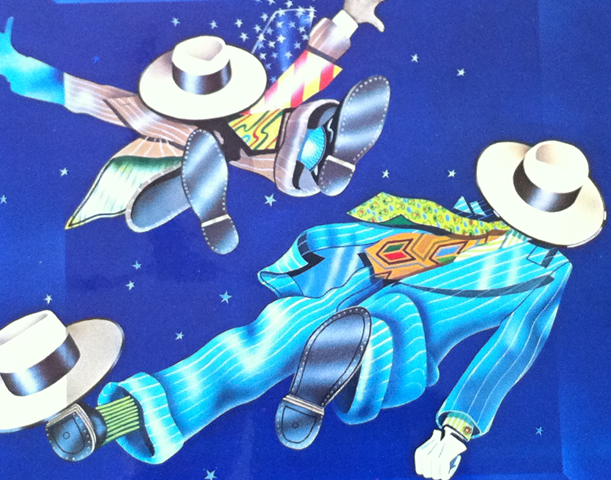 Most of what was in the controversial .NET My Services from 2001 is now accepted as normal, after Google and Facebook have softened us up for the concepts. There’s a pattern here. Microsoft gets bright idea – Tablet, Windows Marketplace, Passport. Does half-baked implementation which flops. Apple or Google works out how to do it right. Microsoft copies them. When do we get Windows 8? You can try and puzzle out the slide on “Windows 8 product cycle” if you like; but I’d bet that it will be around three years from the release of Windows 7: mid to late 2012. What would Microsoft need to do and say to you for you to be happy to call yourself a fan? In part she’s reacting to Frank Shaw’s Microsoft by the Numbers in which he highlights the success of Windows 7, and makes the point that Windows netbooks will likely outsell Apple iPads by 7 or 8 times in 2010, that Linux has not ousted Windows either on the desktop or the server, and that Nokia smartphones will likely outsell iPhones by 2.5 times in 2010. That last one is interesting. Why is Shaw puffing Nokia, when he is VP corporate communications for Microsoft? Well, the enemy of my enemy applies; it’s a jibe at Apple. Nokia now expects its mobile device value market share to be slightly lower in 2010, compared to 2009. This update is primarily due to the competitive situation at the high-end of the market and shifts in product mix. Nokia is being driven down-market. The same thing has happened to Microsoft in the laptop market, with the high-end going to Apple. This is a worry for both companies, since if a company becomes known as “the best” in a particular sector, it may well extend its market share simply by lowering prices or introducing cheaper product variants. This happened to some extent in the portable music player market – only to some extent, because Apple is still more expensive than most of its competitors, but its market share is now huge. I digress. Here are a few observations on the ZDNet post. First, has Microsoft really changed as stated? Microsoft is still paying for the bad old days of arrogance and dubious business practices. I think they’re the bad old days – I spend a lot of time talking to Microsoft insiders, partners and competitors and the attitudes I see have changed, inside and out. 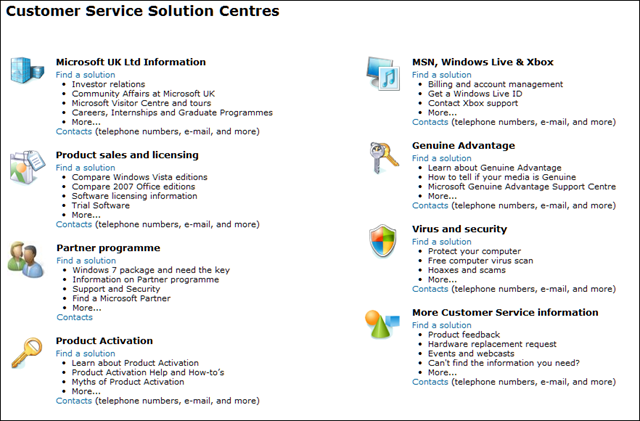 The trouble is, Microsoft is so large and complex that it is hard to generalise. I think of it more as a set of united (or disunited) states than as a single corporate entity. This has always been the case – at least, as long as I can remember, and I don’t go back to the very early days. I can believe that regulation has mitigated the worst practices of the past. But why on earth is Microsoft suing Salesforce.com (and getting itself counter-sued)? It’s terrible PR; it looks as if Microsoft wants to compete in the courts and not on product quality. If it wins and hurts Salesforce.com, what is the benefit to the industry? I realise Microsoft is not a charity, but we are talking business ethics here. More broadly, there are two separate topics that need to be addressed. One is about the quality and prospects for Microsoft’s products and services, and the other is about how it is perceived and why. I’ll take these in reverse order. 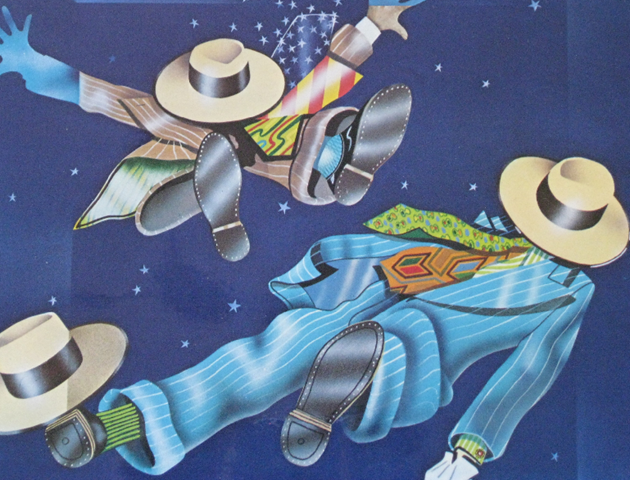 Microsoft has history, as Mary Branscombe says, and more history than just Clippy. It’s the perceptions of the web community that are most visible to many of us, and the piece of history that counts for most is over the web browser. Microsoft beat off the competition, then froze development, an evil act that is particularly hard to forgive because of its cost in terms of devising workarounds for web pages. Yes, that’s changed now, and we have had IE7, IE8, and the promising IE9; but has Microsoft convinced the community that it would not do the same again if it had the opportunity? There are other things I can think of. 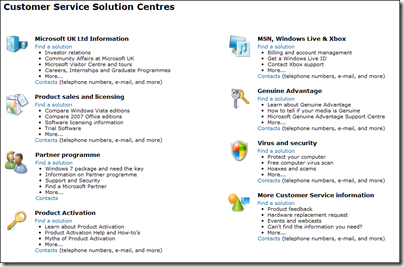 The whole Office Open XML (OOXML) saga, and hints that Microsoft is not following through on its promises. The BlueJ incident. There is also the question of pricing, especially for business users. When I reviewed a Toshiba Netbook recently I figured that installing Windows Pro (to join a domain) and Office would cost more than the hardware. I suppose you cannot blame a company for charging what the market will bear; but when the commodity software costs more than the commodity hardware, you have to wonder whether monopolistic pricing is still present. OK, what about product quality? I tend to agree that Microsoft often does better than it is given credit for. Windows 7 is good; Visual Studio 2010 is great; Silverlight 4 was a bit rushed but still impressive, to mention three offerings about which I know a good deal. 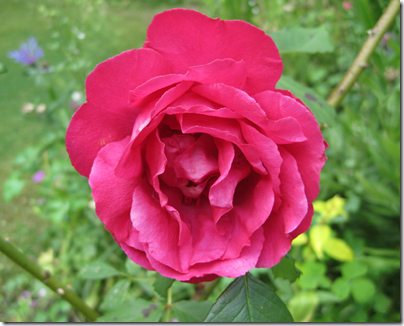 Nevertheless, Microsoft still had deep-rooted problems that I’ve not yet seen addressed. I’ll mention a couple. First Microsoft still has an OEM problem. Going back to that Toshiba Netbook: it was nearly wrecked by poor OEM software additions and the user experience of a new Windows machine often remains poor. Many users do minimal customisation and as a result get a worse experience of Windows than they should. Apple will carry on winning if this is not addressed. Second, Microsoft is conflicted, caught between the need to preserve its profits from Windows and Office, and the need to keep up with the new Cloud + Device model of computing. It is drifting towards the cloud; and developments like Office Web Apps and other one about which I am not allowed to tell you yet are encouraging (wait until next month). This issue will not go away though. Third, mainly as a result of the above, Microsoft still does not convince when it comes to cross-platform. Silverlight is cross-platform, sure; except on the Mac you don’t have the COM integration or any equivalent, sorry, and on Linux, well there’s Moonlight or maybe we’ll work something out with Intel. It is the Windows company. Having said that, I put the Live Messenger app on the iPhone 4 I’ve been trying and it’s great; so yes, it sometimes gets it. What can Microsoft do in order to be better liked? The key to it is this: ensure that our interactions with the company and its products are more often pleasurable than painful. Windows Phone 7 will be an interesting launch to watch, a product where Microsoft has made its best effort to break with past and deliver something users will love. We’ll see. Is the photo quality on Apple’s iPhone 4 good enough that I could leave my Canon IXUS 801S at home? Unfortunately I think not. At least, that was my impression after taking a few snaps today. With the iPhone 4 you tap to focus. I took multiple shots of this flower from various distances, trying to focus it correctly, but it has a tendency to do a better job on the background foliage. It’s not surprising that a dedicated camera takes better snaps than one built into a phone; and I still think the iPhone camera is excellent. But I’ll keep packing the Canon in my bag. Today I was asked to look at a Toshiba Satellite Pro laptop that would not connect to a wireless network. At least, it connected but there was no internet connectivity. I did the usual ipconfig /all and noticed that everything looked OK on the wireless adapter – IP address, default gateway, DNS servers. Nevertheless it could not resolve a ping. I tried various things – reset the TCP/IP stack, updated the Realtek wireless lan driver, even tried with a different wireless access point, but still it did not work. Curiously, a wired connection to the same router worked fine. Investigating further, I found that it was possible to ping remote sites by IP number, but not by name. It was a DNS resolution problem. But what? Even specifying the addresses of known good DNS servers in IPv4 properties did not fix it. This is the Microsoft Virtual WiFi Miniport Adapter. If it is enabled on this machine, then DNS resolution over wireless fails, even though it says “Not connected.” If it is disabled, everything works. So you right-click it, select Disable, and all is well. Problem fixed; but what is this virtual adapter? Long Zheng has an overview. Essentially, it lets you have more than one wifi connection even with only one physical wireless adapter, which means you can make any Windows 7 into a wireless access point. Currently this feature is a development platform that exists only for application developers. and with a link to this article, which explains how to create a wireless hosted network using the netsh command line utility. That’s all very well, but it is annoying to find that a user cannot connect at all, thanks to some unknown interaction with an experimental virtual device that is of little practical use. What I still do not know is how to fix the issue properly, instead of just disabling the virtual device. The problem is not universal; in fact, the netbook on which I am typing this post also has a virtual wi-fi adapter and it does not cause any problems. I doubt the user will suffer any adverse effects from its absence though. Update: Kelvyn Taylor points out that the handy Connectify utility uses this feature of Windows 7. 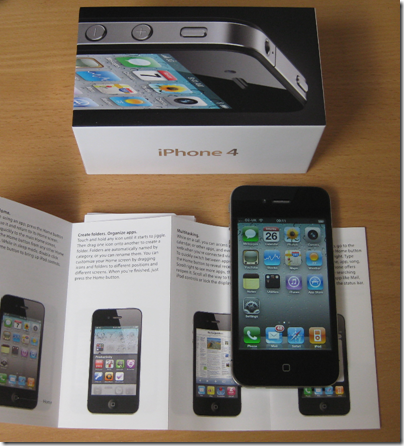 I’ve been trying out iPhone 4 since its launch on Thursday this week. My main interest is software development, and I have a couple of ideas for apps. Apple’s platform is annoying in several respects, especially the App Store lock-in and the Apple tax, but it is unavoidable. Unfortunately when a company gets the idea that it should support the fast-growing mobile device sector with an app, the iPhone is the one they think of first, and iPad follows. Google Android is coming up fast, thank goodness, but has nothing like the mindshare or market share of Apple’s device platform. Software developers have another reason to study the iPhone, which is as a case study in software design and usability. After using iPhone 4 for a couple of days, and watching friends try it even if they have not used one before, I am full of admiration for what Apple has achieved. There are a few basic concepts to grasp – home button, breadcrumbs, swipe and multi-touch – after which it is mostly delightful. There is hardly any documentation in the box – though there is a downloadable manual – just a brief leaflet describing a few essentials, but discoverability is good, especially with a little help from Google. Need a screen grab, for example? Press and hold home and tap the top button. The grab turns up in the camera roll. It’s not something you would find out by chance, but only a search away. Text input is a big deal for me. I am much faster on a real keyboard, but the iPhone is as good as many thumb keyboards. Again, there are things you have to discover. There are no cursor keys, but if you hold down an area of text a bubble appears, and sliding your finger left and right moves the cursor so you can easily correct an error. 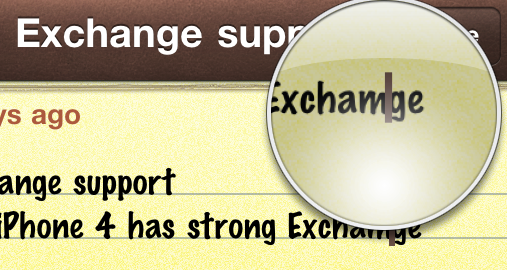 The Exchange support, by the way, is excellent. I put in the settings for Outlook over HTTP; the iPhone complained briefly about my self-generated digital certificate and then connected without any hassles. The device picks up all the folders in the inbox without any additional configuration. The one feature I would like to add is the ability to select a different sending email address; if anyone knows a way to do this, let me know. I am also impressed by iPhone Safari. After struggling with an old Windows Mobile browser, it is a relief to have a proper web browser restricted only by its small screen; pinch and zoom copes with most problems though it is always going to be a limitation; sites optimised for mobile work better. Google Maps is great too. The GPS works well, and finding your way around is a snap. The high resolution screen is lovely of course, and the camera is superb. I will do some comparisons against my Canon Ixus, but if I keep the phone it might save me the need to carry a separate camera when out and about, at least until the lens gets scratched. Anything not to like? A few things. The price, for one, especially when supplemented by whatever scheme your mobile operator devises to separate you from your money. Many schemes offer only 500MB per month data allowance; not enough, especially as data usage can only increase. There’s also the iTunes problem. I know others like it, but I personally don’t get on well with iTunes, finding it bloated and annoying. I don’t allow it on a PC, but keep a Mac Mini handy for when I need to do the Apple thing. It is absurd though that you cannot use an iPhone without activating it first via iTunes. What happens when a user decides that iPad plus iPhone plus cloud is all they need? I can’t help wondering if Apple simply wants to ensure that as many people as possible install its online store. Whenever I connect the iPhone, iPhoto pops up and wants to import photos, even the ones that I’ve already imported. I have to check the option not to bother with duplicates every time. There must be a way of avoiding this annoyance, but I’ve not spotted it yet. 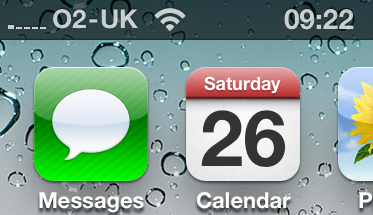 Then there’s the reception issue. It’s well known that many, possibly all iPhone 4 models have a bug where if you hold it in the normal way, your hand bridges a gap in the external antennas and damages reception. Steve Jobs says that reception issues when holding a phone in a certain way is “a fact of life for every wireless phone”; this is arrogant spin and I hope Apple gets lots of returns or at least hands out for free the bumper cases that apparently resolve the issue. That said, my iPhone is on O2 and at home the reception is terrible however I hold the phone, even though I am in a high coverage area according to O2. At my desk I get only one bar and calls are not always possible – which means I will have to cancel the contract. I did manage to fit the micro sim into my old Windows Mobile phone to see if it is just an iPhone problem. It was just about as bad, so no, it is O2. In general I’ve not been impressed with the O2 reception in my part of the world, though it is excellent in our local O2 shop; perhaps they have a booster under the desk. There are little niggles elsewhere too. 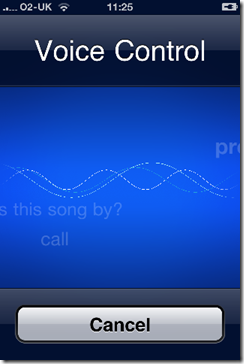 I tried Voice Control, for example, and found it useless; perhaps I have the wrong kind of voice. 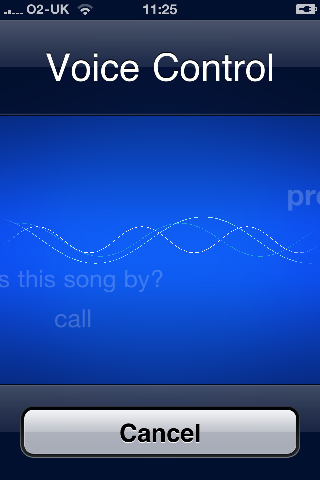 If I speak to play a song, there is 25% chance that it plays, 50% chance that I get a “no match” error message, and 25% chance that it dials a random person in my address book. A hidden social media function? A number of negatives then; but the iPhone contrives to be good enough that users overlook any faults because they like it so much. It’s certainly a better experience than the last Android device I tried; though that is well out of date now, and I intend to look closely at Android 2.2 “Froyo” as soon as the phones become available. Update: As far as I can tell, if you buy your iPhone at a store it will be activated for you, so you don’t need iTunes to get started. However iTunes is necessary if you receive your iPhone by post and activate it yourself. I’ve just installed the third Internet Explorer Platform Preview (on a virtual machine just in case) and run through a few of the demos. 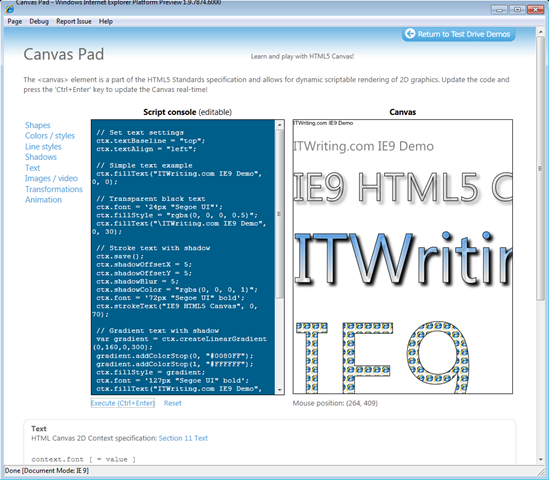 One of the most impressive is Canvas Pad, which demonstrates the HTML 5 Canvas element. Like all of the graphics in IE9, canvas is hardware accelerated through Windows and the GPU. 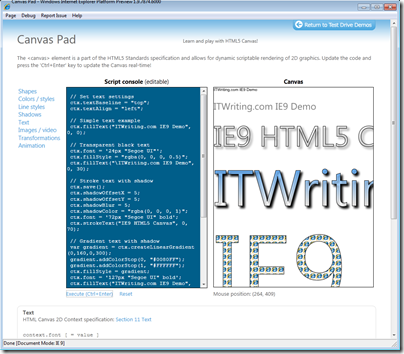 Hardware accelerated canvas support in IE9 illustrates the power of native HTML5 in a browser. Even so, once you have hardware-accelerated Canvas there will be few occasions when you absolutely have to use Flash, Silverlight or Java. Microsoft is doing the right thing. Crippling IE for the sake of Silverlight would only push users to other browsers, so it would not achieve its goal. A full list of what is new in IE9 is here. It is shaping up to be the most interesting new IE since version 4.0 back in 1997. Adobe has released its financial results for its second quarter, reporting $227.3 million net income (GAAP) compared to $161.4 million in the same quarter last year; and revenue of $943 million which it says is 34% year on year growth. Much of this is thanks to a successful launch for Creative Suite 5, which accounts for 56% of Adobe’s revenue. However, Adobe has also reported 12% year-on-year growth for LiveCycle, its enterprise server products about which I learned last week in Amsterdam. The “platform” segment, which includes the Flex development tools, Cold Fusion, and Flash media services, is also growing, from $36.8 million in Q2 2009 to $45.4 million in Q2 2010. CEO Shantanu Narayen is upbeat, saying “we believe Adobe is significantly undervalued today” and backing his judgement with a share buyback program. making the point that this exceeded the growth of CS5 overall. The other issue is that Adobe is dependent on Creative Suite, desktop software that arguably will be a business hard to sustain in the cloud and device era. Still, these are good figures, the best we have seen from Adobe for a while, and despite the efforts of Steve Jobs both Adobe and Flash are prospering right now. A side-effect of Apple’s Flash downer is that competitors have hastened to support it, with Google building Flash support deeply into its Chrome browser. Detailed figures from Adobe are here. 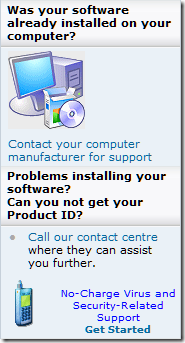 A user contacted me about a problem installing Microsoft Office 2010, just released. He had gone to John Lewis, a department store with a good reputation for quality, and purchased a Windows 7 laptop that had Office 2010 pre-installed, along with a Key Card for Office 2010 Home and Business. The idea is that you run Office, activate it with your product key from the Key Card, and you’re done. 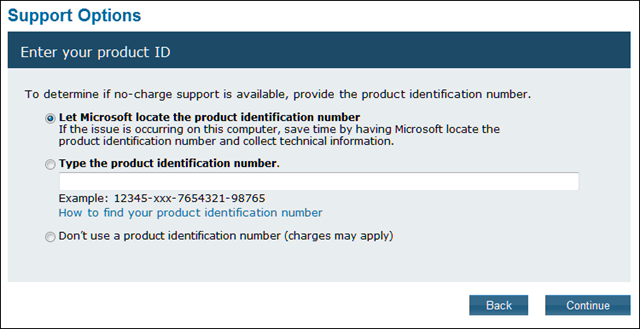 Unfortunately the Office 2010 setup failed, after he had entered the product key but before it opened for the first time. The failure was in phase 3, whatever that is, gave a message about missing prerequisites, and advised to rerun setup, and if that failed to contact support. Repeating the operation gave exactly the same error. Indeed, this leads to a demand for £46.00 before proceeding. Which hardly seems reasonable for a new setup on a new laptop. Whew! So you click something vaguely promising such as “More Customer Service Information” and end up with a link back to the product support page you have just left. Or you dial the number which appears: 0844 800 2400. This is where the story gets a little confused. The user told me that when he first called, around 7.00am, he got two options. 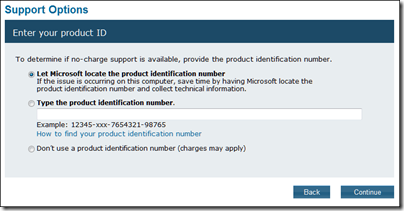 Help with activation, or chargeable support. Neither appealed. 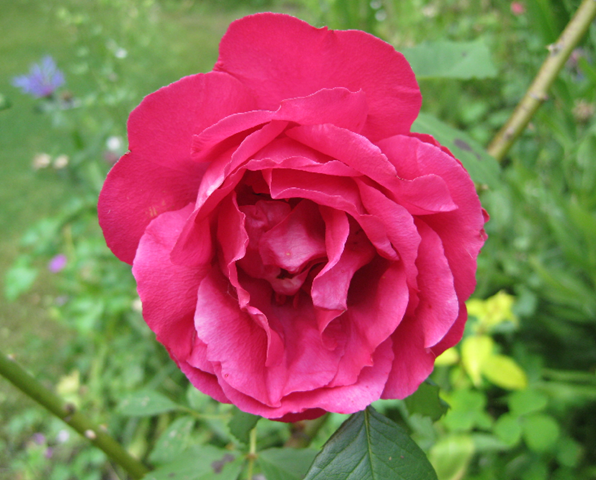 However, when he called again, around 10.00am, he got more options including a route to the free support he needed. Once he got through, the incident was dealt with speedily and effectively; he was soon up and running. It sounds odd to me, since the number does not indicate any specific hours of operation, but there it is. 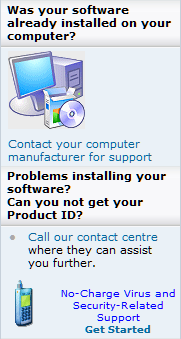 Still, I think the support web site could be improved. Users get particularly frustrated when confronted with setup issues; configuring a new laptop is hard enough even when everything works. For example, if someone thought of the issue with not being able to get the product ID, why not also link directly to the correct number, instead of a page with 16 options, some of which lead you round in circles? There is a fascinating interview over on The H with Michael Meeks, who works at Novell on OpenOffice.org development. It would be wrong to call OpenOffice.org unsuccessful: it is a solid product that forms a viable alternative to Microsoft Office in many scenarios. Nevertheless, it has not disrupted the Microsoft Office market as much as perhaps could have been expected; and Meeks explains what may be the reasons – tight control by Sun (now Oracle) and a bureaucratic approach to project management that has stifled the enthusiasm of the open source community. In some places they do feed stuff back. We see their changes, but parts of Symphony are not open source, and we don’t have the code for them, and interestingly, there is no source code available so far as I am aware of the version of OO.o that IBM is shipping inside their product, so clearly they’re not shipping this under the LGPLv3. IBM have a fairly public antipathy towards the GPL unfortunately, and as a consequence you have to wonder what terms are they shipping OpenOffice under – and as there is a lot of my code in there, not only my code but Novell’s code and a lot of other people’s code, you have to wonder ‘What were the terms and what was the deal? That’s a shame, and would really help improve the transparency and confidence in Sun’s stewardship around these things. The code was assigned to Sun, and I have no doubt there is no legal problem at all, but a lot of people have assigned their code to Sun in good faith, believing them to be good stewards. Maybe they are but its impossible to tell without knowing the terms under which third parties are shipping the code. Meeks says that the Oracle takeover is an opportunity for things to get better. Even if you like Microsoft Office you should hope that it does, since a strong OpenOffice puts pressure on the competition to keep prices down and product development up. Further, Microsoft has no plans for Office on Linux that I know of – unless you count Office Web Apps.